A popular area with a good mix of sport/trad climbing. The area has seen a lot of re-equipping, new routes and general spring clean in the last few years. Many people convert an ascent if Looning The Tube for their first E1. Just before the scree slope leading to the looning level are two tunnels. This climbs the left wall of the right hand tunnel starting just in from the entrance. Move up to a bore hole and traverse right via pinches edges and shots to finish about twenty feet in at a mono bore hole in the roof. plug in a finger to finish. New route. Left of Just for Fun. Climb the cleaned flake/groove upto the central ledge. Make a tricky move up the cleaned slab above. 2 B.R.’S protect to a twin bolt belay. 14/05/09. Jim Kelly/ Julia Kelly. Very popular line to right of tunnel up obvious bolt ladder up a leftward leaning corner to belay rings set well back from top edge (lowering off not recommended). Good climbing! New lower off, existing bolts are stainless steel. Brief Encounter ** E1 5b. Sad Man Who’s Sane VS 4c. Climb the slab just right of Gadaffi Duck moving occassionally left to the arete. Cleaning up with ascents Lower-off bolt has a loose nut. New Lower off 2013. Right of Sad Man Who’s Sane, climb the slab/arete just left of Turn of the century past two bolts with single bolt lower-off. 09/06. Second lower off bolt added 2013. Arete left of turn of the century. 4 bolts. Twin bolt lower off added today 2/3/08 . Maximum Tariff **6b. New route. Quality reachy climbing taking the obvious crack passing 4 bolts to a lower off. Technical hamster 6c New route. Boulder problem arete right of dried mouth sesame seed. 2 bolts and lower off. Lower off bolt replaced today with ring bolt 2/3/08 (technical hamsters will climb the arete direct on the left hand side!!). Arete direct on right hand side, feel free to retrobolt. Menai Vice E4 6c or 6b (debate!!!). A bold lead up the wall to the right of M/Vice, one skyhook protects!! Superb direct start to ‘Looning The Tube’. below the huge, easy-angled ramp. Make a move leftwards past a big block to a bolt belay and stance. foot of the ‘Looning Crack’. Protect using the metal chain, Friend 2 1/2 and original bolt. This is a superb 25 metres sustained pitch which now very much supercedes the original route without losing any of its character. F.A. Jim Kelly / John Redhead 27/03/2010. Zzzooming The Tube E3 6a New route. Climbs the well-cleaned slab right of the Looning the Tube routes and left of the unstable pillar. 5 B.R’s protect with twin bolt lower off.. Access via an abseil from 2 bolts at the foot of “Steps of Glory” (F5) on the tier above (2nd rope reqd.) or, via the Tunnel of Love. A good route and should prove popular. Opens up possibilities further right on this section of slab.F.A: Jim/ Julia Kelly, John Redhead. 31-05-2010. Climb the slab as for **** Les Clotures to the 3rd bolt on that route. Here, make a delicate traverse right (bolt) to small edges on the slab. 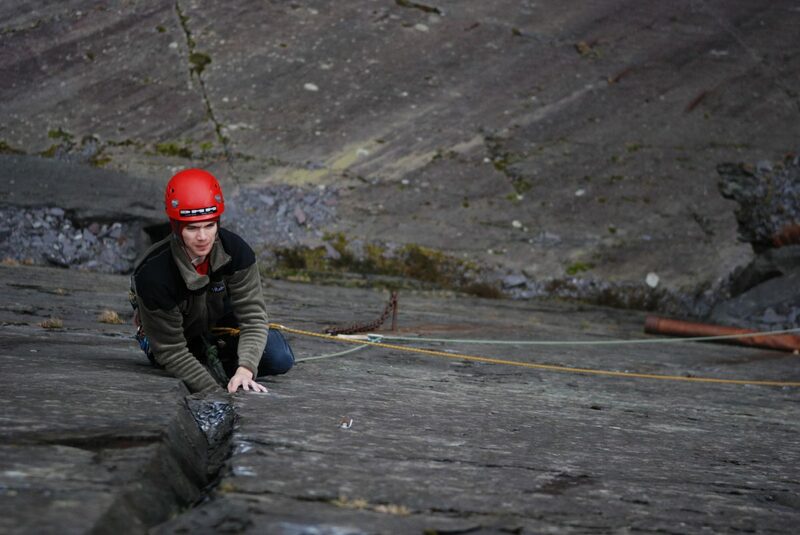 Now make a seties of committing technical crimps up the steep slab above (bolt). A worrying move to gain the lower off adds a sting in the tail !! Yet another good addition to this previously neglected area of slab. CARTOON LESBIANS F6a *- 5 BR’s to twin B lower off. Climb the steep area of slab just right of the fallen block/pillar in the centre of the main slab. 5BR’s protect to a twin bolt lower off. Well cleaned and quite sustained climbing for its grade. A good addition. F.A. Jim Kelly & Julia Kelly 10.10.10.